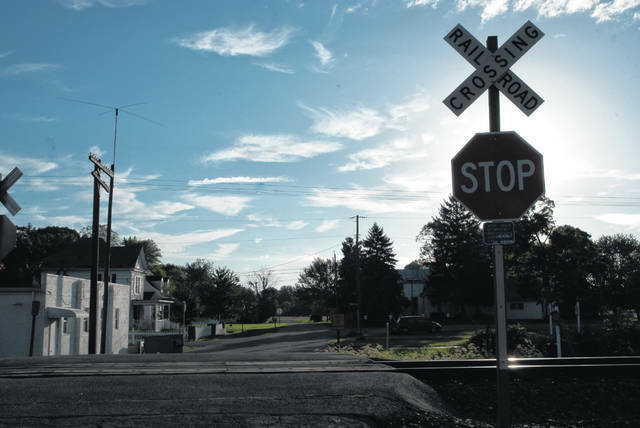 The railroads, CSX and Norfolk Southern, are pushing the Ohio Rail Development Commission to get consensus from Orange Township to close the crossing on Franklin Street in the small village of Lewis Center. The commission met with trustees and residents on the matter in a regular trustees meeting Oct.1. Ohio Rail Development Commission (ORDC) Executive Director Matthew Dietrich addressed the Orange Township Board of Trustees during its Oct. 1 meeting about achieving “a win-win and not a lose-lose” when it comes to the Franklin Street railroad crossing. He had sent a letter on Aug. 14 giving the township only 30 days to meet with the commission. “So, we needed to schedule this meeting as soon as possible, and you were not available for the last meeting of September, so that’s why we had to hold the meeting today,” said Trustee Lisa Knapp, pointing to the urgency to have the meeting. Township Administrator Lee Bodnar had received a letter from the railroads that own and operate the tracks, CSX and Norfolk Southern, demanding action from the township or they would pursue legal action against the township. Dietrich said the commission’s job, as a state agency, is to figure out if there are any type of negations which could bring a mutually satisfactory conclusion before it becomes a legal process. “Once it becomes a legal matter between the railroad and community, we’re out of it,” Dietrich said. Dietrich added there is a lot of “railroad interaction” within the double set of tracks running through Orange Township. He stated that the commission has no statutory authority to open or close crossings. Julie Kaercher, ORDC public information officer, spoke with the trustees in June 2017 about the crossing. She said in 2012, ORDC conducted a study of rail crossings searching for potential closures, but the proposal to close the Franklin Street crossing was then put on the back burner in 2013. Dietrich said the crossing fell within a “hazard index,” which he explained to be a formula that accounts for “train traffic, vehicular traffic, skew, accident history, and such.” He said the commission has worked with the community for “quite a while” and mentioned the commission’s offer of incentives to trustees to close the crossing. The commission had enticed the trustees in 2016 with an offer to help expedite the construction of a new trail crossing on Orange and Lewis Center roads if the township supported the closing. The commission also offered $237,500 for any additional cost the township might incur relative to the closing of the crossing. Dietrich said there was a crash reported at the crossing as recently as 2017. He said if the crash history is factored into the equation, the cost of the lights and gates will be high. David Dill, who lives on Franklin Street, refuted the report of the 2017 crash. Dill said he has lived in the village for 28 years and there has only been one other accident. He said that a resident who lived on the other side of the tracks was driving a van that slid off because of icy roads. Bodnar said he reviewed the Ohio Revised Code on the matter and read a section concerning rural railroad crossings. Dietrich clarified the commission as meaning the Public Utilities Commission of Ohio. Trustee Ryan Rivers asked Dietrich if there had been any discussion and consideration about the current construction along Lewis Center Road and the future construction of the roundabout at North Road. He wanted to know what the impact on the area would be if the crossing was closed. Dietrich stressed to him that the role of the commission is to work with the local community on those types of concerns. He said they would make sure those types of things are included in the trustees resolution. Dietrich said that in a letter those things had been brought to the attention of commission, including a potential underpass. “We’ll defiantly be focused on this letter this time,” he said. “We can provide assistance to a community, but we can not just provide a lump some payment because it has to be targeted for eligible cost” since they are federal highway safety funds. Dietrich said the railroads have been patient for five years. “Their patience is getting a little (thin),” he said. Based on conversations he has had and letters from the railroads, Dietrich said they intend to petition PUCO. This entry was tagged D. Anthony Botkin, Franklin Street, Lee Bodnar, Lisa Knapp, Matthew Dietrich, Ohio Rail Development Commission, Orange Township, Railroad Crossing, Ryan Rivers, Trustees. Bookmark the permalink.